Nowadays most people consider Father Christmas and Santa Claus to be different names for the same person, with Father Christmas tending to be more UK-centric while Santa is more commonly used in the US. However these two have very different histories, which have only recently converged. The legend of Santa Claus seems to have originated with Saint Nicholas, a Bishop who lived in Myra in Asia Minor (now Turkey) in the 4th century. He inherited a lot of money from his parents, who died when he was young so was very rich. He travelled around in his red bishop’s robes and had a reputation for being very kind and helping the poor, but was also apparently very shy. One of the legends associated with him is that one day, wanting to give money to a poor family for the dowry of the eldest daughter, but not wanting anyone to know, he dropped some gold coins down the chimney. These landed in a stocking hung up to dry by the fireplace and belonging to one of the daughters. He repeated the same generous act for the second daughter. The father, curious about who was helping their family, waited up and discovered Saint Nicholas doing the same for his third daughter. The Bishop asked him not to tell anyone else, as he didn’t want to draw attention to himself, but rumours got out and he became known for his gifts to children and the poor. The legend of St Nicholas only came to Britain after the Norman invasion, when it was absorbed into our own Father Christmas legend. Father Christmas was initially just a pagan figure representing the coming of Spring, who wore a long hooded green cloak and a wreath of ivy, mistletoe or holly. In the 5th and 6th centuries Britain fell under Saxon rule and he took on the attributes of the Saxons’ Father Time (also called King Winter). It became traditional for someone to dress up as King Winter and be invited into people’s homes to sit and eat and drink by the fireside. People believed that if they were kind to King Winter they’d get a milder winter and so the association between Father Christmas and receiving good things was born. The Vikings added to the tradition with their own. During Yuletide the Norse god Odin was believed to take on the character of Jul, a stout old man with a white beard and long blue hooded cloak. He dealt out gifts to the good and punishments to the bad. When the Normans arrived, the story of St Nicholas came along too and was absorbed into the legend of Father Christmas. From the 15th century onwards, Father Christmas was seen as the representative of the spirit of Christmas – good cheer, generosity and kindness. Unfortunately in 1644 the Puritans banned both Christmas and Father Christmas himself, offended by his pagan roots and the revelry associated with him. For a while he was only seen in Mummers Plays and underground newspapers and came to represent what people missed about Christmas. He was only revived again in Britain in Victorian times. He was then known as a jolly pagan figure in a long hooded coat incorporating various aspects of his predecessors. 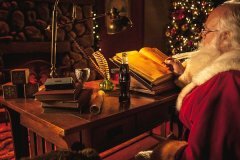 By the mid-twentieth century the American influence had also taken hold and the characteristics of St Nicholas were incorporated into our Father Christmas, including the idea that he lives in the North Pole, has a list of naughty and nice children, and wears a red coat. The red coat was as much due to Coca Cola’s 1931 advert as to St Nicholas’s original red bishop’s robes, Father Christmas having been depicted in all sorts of colours previously. So although Santa and Father Christmas are very much the same now, it took many hundreds of years for them to merge in people’s minds, with the UK’s Father Christmas having a varied history for centuries prior to that.